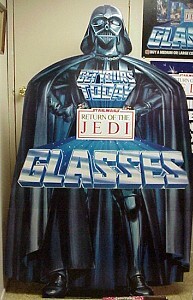 This ROTJ standee of Darth Vader is probably the largest display piece issued by Burger King during their three Star Wars promotions. Its also one of the more commonly-seen Burger King displays. Typically, it features some striking arwork; that image of Vader with his arms on his hips is a great one, and the innovative text gives it a sense of dynamism. Will doesn't just have this Vader standee, but the entire store promotional kit of which it was a part. According to him, the display came with some translites advertising Burger King food items, a poster promoting the release of Return of the Jedi, and a bag of water to use as a counterweight for the display. Interestingly, it also came with some alternate lettering, reading "coming soon," which could be used in place of the "get yours today" component should the display be set up prior to the time in which the glasses were available.